A mix of hemp with clay and lime plaster, a form of hempcrete, has preserved caves in India for 1,500 years. 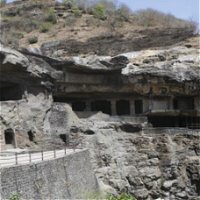 A paper detailing the discovery at Ellora Caves, by Rajdeo Singh and M M Sardesai, was published earlier today in the journal Current Science. The Ellora Caves are a World Heritage site located near a village approximately 30 kilometres northwest of Aurangabad city, Maharashtra, India. The 34 caves were man-made; cut into rock and plastered internally. The site was utilised for religious practices; with 17 Hindu, 12 Buddhist and 5 Jain caves. The plaster of one of the Buddhist caves, still in good condition, was examined and found to contain pounded shoots, leaves and the flower of the Cannabis Sativa plant. This cave was wide open to the elements, which has led to an uncontrolled amount of humidity inside the cave during the rainy season. These sorts of conditions would usually result in plasters deteriorating at a fairly rapid clip. The study is a major vote of confidence in hempcrete and confirms what many of its supporters already know; that hempcrete is pretty much forever. “The long life of clay plaster at Ellora, despite damaging environmental parameters, may be attributed to the material properties of hemp,” say the authors. “The hempcrete plaster of Ellora must have provided a healthy, comfortable and aesthetically pleasing living environment to the Buddhist Monks to stay”. The authors praise industrial hemp’s potential for building applications; stating hempcrete is greenhouse negative, has high thermal mass, creates no toxic by-products, dampens sound, is fire-resistant, has higher vapour permeability and improves indoor air quality. The stalk of hemp plant is made up of fibres that are soft and flexible and hurds; which are rigid and hard. A combination of hemp hurd, lime, clay, cement and water in various proportions has been used for centuries in construction – and not just in India say the study’s authors; citing an example in a bridge abutment in France that dates back to the 6th century AD.